Hello again, and welcome to this week’s Watercooler Wednesday Challenge! This week’s challenge WWC64 is CAS – Spring Theme, which is Clean and Simple design, with a Spring theme. Not too shabby, right?! I started out with a panel of Whisper White cardstock, and stamped the sun from Kinda Eclectic in Daffodil Delight in the upper left hand corner. I then stamped the branch from Choose Happiness twice; I used my Stampin’ Write Markers in Crumb Cake and Mossy Meadow to colour directly onto the stamp. I then used my Crumb Cake and Pear Pizzazz markers to colour in the branches and leaves, after stamping. (I have to say, I’m very sad that Choose Happiness is being retired; it’s one of my favourites, and I think I’m going to hang on to it for a while longer). I inked up the sentiment from the Tin of Cards stamp set first in Versamark, then Soft Sky ink. After stamping, I covered it in Clear Embossing Powder and heat set it with my Heat Tool. It’s such a soft colour, it doesn’t stand out well, so I thought that the embossing would help. To add a bit of depth, I did use a Blender Pen and Soft Sky ink to lightly shade around the branches – doing my best to stick to Clean & Simple! To keep it clean and simple, I stayed with the Daffodil Delight cardstock for my card base, and added a panel of Soft Sky cardstock under the Whisper White, after first using the Curvy Corner Trio Punch (also retiring *sniff*) on the bottom right hand corners. I think I did okay – what do you think? I’d love to read your comment, if you have time to leave one. But do make time to check out the cards from the rest of the Watercooler Artists – they are great! Then of course we’d love to have you link up your own card for the challenge; I get so much inspiration from seeing your cards! Thanks for spending some time with me – until next time, happy stamping! As usual, you have done a maaaarrrhvelous (dahling) job! I love its simplicity, and cheerfulness! We have homes in KY and in FL, as well as friends whom we miss when we’re in the “other” state. This is definitely going to be one that I’ll be sending those “out-of-stater”s. Thank you so very, very much for sharing AND for giving your specific directions! Deb, this is a beautiful card. It is soft and sweet, with that special corner detail! 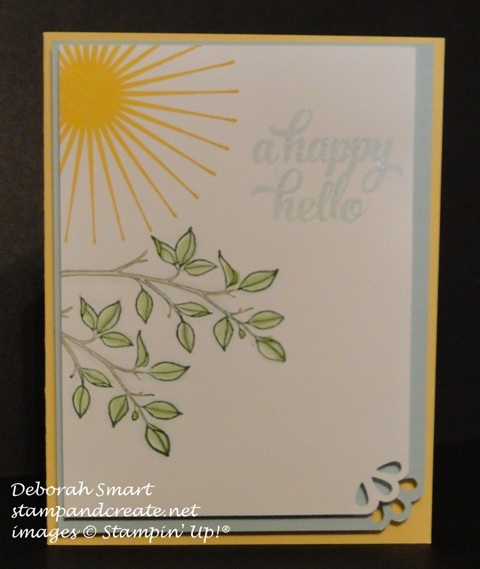 Deb you’ve created a really beautiful CAS card this week. I love how you brought in the sun and just the hint of the leaves and the beautiful sentiment. It simply flows. Thanks for sharing all the directions too, I always really appreciate that.